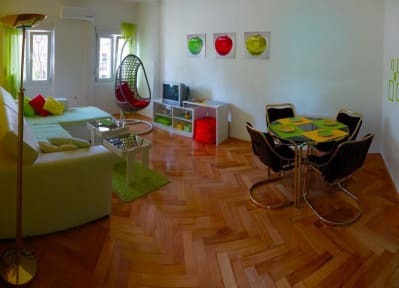 The apartment Zara (50m2) is located on the 3th floor, it has one bedroom with two single beds, living room contains a sofa which can accommodate two persons, fully equipped kitchen and bathroom with shower. 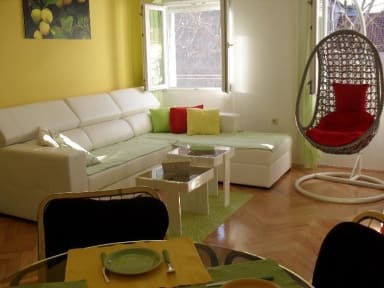 It is equipped with free wifi, air condition, TV, washing machine, refrigerator with freezer, iron, linen and towels provided.The apartment is only 30m from the sea, and is completely surrounded with all the historical sights, museums, restaurants,cafes, and is easy to find. Despite the central location of the apartment, it is very quiet, as it is facing the garden. The bus to Zadar airport takes 30 minutes and cost 25 kuna a ticket, just under £4.00. If you have a car you can park it at the public parking lots around the centre of the town. Daily tickets are available.